Here’s a question – when does a band start losing it? It does happen to every band who’ve had a significantly long career, where the creative well they’ve been mining begins to run dry, and albums suffer a dip or, as a worst case scenario, a constant decline in quality as a result. Which brings us to Billy Talent, a band who, since 2003, have spawned four absolutely fantastic albums. While that might be the case, it does imply that further albums will struggle to live up to the almost unfeasibly high benchmark the band have set for themselves. It means fifth album Afraid Of Heights has a lot to prove, whether Billy Talent are still at the same level they once were. To be perfectly honest, they’re not. That’s not to say that Afraid Of Heights is a bad album though – far from it – but a different one. While the gradual shedding of the band’s punk skin has been taking place over their last couple of albums, this fifth effort sees the metamorphosis fully completed with Billy Talent become a straight-up rock band. It’s akin to the sort of transformation Green Day undertook on American Idiot, although Afraid Of Heights isn’t as strong overall, and that’s mostly because it doesn’t feel as though Billy Talent are entirely comfortable in this new skin yet. It does appear that the band run out of ideas partway through, meaning that the album ends up tailing off with forgettable cuts like This Is Our War and February Winds, or the blatant Knights Of Cydonia cribbing of Horses & Chariots. And the fact that the band resort to a stodgy, electro-sodden reprise of the title track to close out is a dead giveaway that this is something that they’re still getting used to. Having said all that, and because this is Billy Talent after all, most of Afraid Of Heights is pliable enough to work with a more straightforward rock sound. In fact, from a songwriting perspective, they’ve even improved, moving past the simple rhyme schemes and melodies that were especially prevalent in the first three albums. And with their typical gusto and oomph remaining intact, Afraid Of Heights packs in a handful of genuinely great songs. For the first half at least, there’s very little to complain about. As well as the likes of Ghost Ship Of Cannibal Rats and the title track which are Billy Talent at their vintage best, there’s the hip-swinging rock ‘n’ roll of Louder Than The DJ that packs the sort of wallop as any rock club staple, and The Crutch, a surging beast of a track that’s easily the best on the album, dark and brooding with a huge melodic crunch. Perhaps the biggest curveball though, is Rabbit Down The Hole, the six-minute midpoint that makes up for being slightly monotone in pace with some of the most adventurous and broadly explorative the band have ever been. 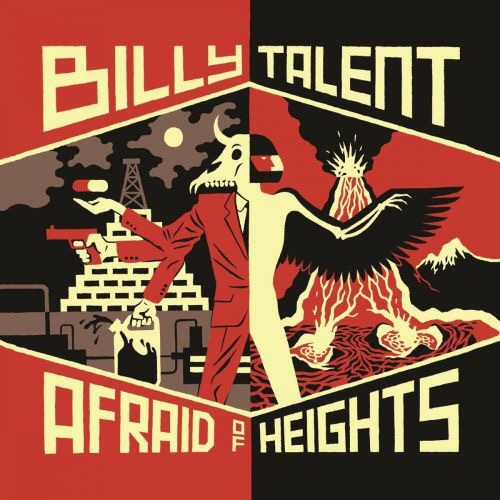 Perhaps the best thing about Afraid Of Heights though is, for all the alterations in sound Billy Talent have undergone, they still sound like themselves. It’s certainly a more mature take on their core sound, but done so in a way that isn’t conducive to boring. Ben Kowalewicz’s sharp yaps still pack in as much firepower and venomous polemic as ever, while Ian D’Sa’s staccato guitar work has a vitality that manages to fend off any sort of stagnation. Although the final act of the album does drop into a more beige mould, there’s a consistent, solid effort made to steer Afraid Of Heights away from radio-rock banality which most of the time is pulled off well. That’s probably the aspect of Afraid Of Heights that’s worthy of the most praise. Even after a change in sound such as this, Billy Talent are well aware of their strengths at this point and play to them accordingly. As a result, this is an album that’s buoyed up by consistency over time integrated into a new sound, and while the same kind of consistency isn’t entirely present, it’s nowhere near as drab or flabby as it could’ve been. And even with Afraid Of Heights probably being Billy Talent’s worst album to date, it does everything it needs to do – it shows a transition to new sonic environments, and shows how well it can be done when honed to its fullest. In that respect, Afraid Of Heights is pretty much as good as it gets. ‘Afraid Of Heights’ by Billy Talent is out now on Warner Music Canada.